The 10.05-carat "Ratnaraj" ruby and a flawless, 4.29-carat, fancy vivid blue diamond each sold for more than $10 million and were the costars of Christie's Magnificent Jewels sale in Hong Kong last week. The stunning Ratnaraj, which means "king of precious stones" in ancient Sanskrit, was one of the most significant pigeon’s blood rubies ever to be offered at a Christie's auction. The oval gem, which was sourced in the famous Mogok Valley in Burma, sold for $10.2 million, or just over $1 million per carat. The result was the third-highest price per carat ever paid for a ruby. 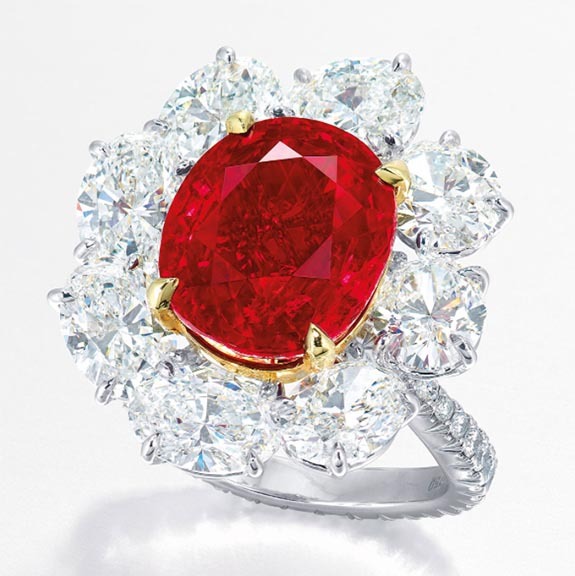 The record holder remains the "Crimson Flame," a 15.04-carat ruby that sold at Christie's Hong Kong in December of 2015 for $18.3 million ($1.21 million per carat). The 25.59-carat Sunrise Ruby holds the record for the highest price ever paid for a ruby at auction — $30.3 million at Sotheby’s Geneva in May of 2015. Ratnaraj's selling price was in the midrange of the pre-sale estimate of $8.8 million to $12.5 million. Had it sold at the high end of the range, it would have competed with Crimson Flame for the price-per-carat record. "Top-quality Burmese rubies are rare, especially ones that are more than 5 carats in size," explained Christie's Hong Kong jewelry specialist May Lim. "In recent years we’ve been lucky enough to find a number of amazing rubies for our sales." The Ratnaraj is the centerpiece of a ring designed by Faidee. The setting places the oval ruby within a radiating surround of oval-shaped diamonds. Smaller, round diamonds adorn the band. The pigeon's blood classification represents the most desirable, highly saturated color for a ruby. Yielding an impressive $2.7 million per carat was a marquise-cut, 4.29-carat, fancy vivid blue, internally flawless diamond. 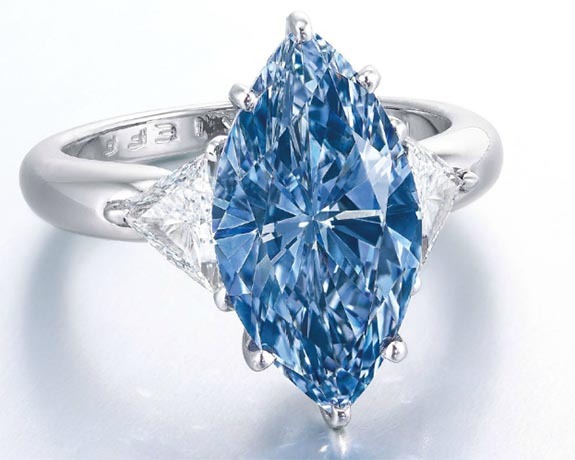 The selling price of $11.8 million made the blue diamond the top lot of Christie's Hong Kong auction. The pre-sale estimate had been $9.7 million to $12.3 million. The impressive blue gem is set in a platinum ring by Moussaieff and is flanked by triangular-shaped diamonds. The center diamond earned a purity rating of Type IIb, a rare category representing less than 0.5% of all diamonds. Fancy vivid blue diamonds continue to yield the highest prices at auction. “The Blue Moon of Josephine” established a new record for the highest price paid per carat for any gemstone when the hammer went down at Sotheby’s Geneva in November 2015. The internally flawless, 12.03-carat, cushion-shaped, fancy vivid blue diamond sold for $48.5 million, or $4.03 million per carat. In May 2016, “The Oppenheimer Blue” became the priciest gem ever auctioned when it sold for $57.5 million at Christie’s Geneva. The fancy vivid blue, step-cut, rectangular-shaped diamond weighed 14.62 carats and earned a clarity rating of VVS1. Its price per carat was $3.96 million.